The NFL Draft is nearing and before you know it you will be drafting in Fantasy Football. 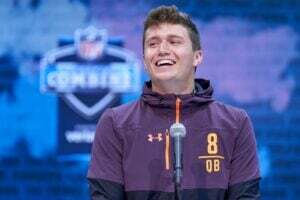 The NFL Draft is when I believe many begin to get excited about the new rookies and then there is a lull before the large portion of drafts are completed in July and August. I have found that many fantasy players tend to jump on board rookie hype trains without even knowing much about the player. That strategy can work for you, but I think it is better to know the prospect and their strengths and weaknesses heading into the draft. Knowing their talents will better help you decide if they are a good fit with their new team and if they can help you win in Fantasy Football this season. To me, the most interesting position this year is wide receiver, so let’s break down the top prospects! Harry is my favorite of the receivers in this class. Harry has good size at 6’2 and 228 pounds. He does not possess the highest ceiling of receivers in this class, but I think he is the perfect combination of safety meets upside. Harry can play both outside or move in the slot, which is perfect for today’s NFL. Slot receivers are no longer just receivers with good hands who cannot create separation. More and more we are seeing big wideouts like JuJu Smith-Schuster, Michael Thomas, Keenan Allen and Doug Baldwin doing damage from the slot. Harry should study those receivers and hopefully the team that drafts him utilizes him in a similar fashion. Harry is a physical receiver who is good at getting his body in front of defenders at the point of the catch. Once he has the ball in his hands, he is dangerous as he can create large chunks of YAC. He is a precise route runner as well, who has the physical tools to be the top receiver off the board. The knock on Harry is that he is missing the explosiveness that you typically see high-end receivers possess. He ran a 4.53 40 at the combine and relies more on his physical play to create separation rather than pure speed. The hope is a team willing to use him in the slot at times drafts him. A great fit would be the Packers. Some other fits are the Titans, 49ers and even the Seahawks. Much like Harry, Brown can also play in the slot, Brown is the prototypical big slot receiver perfect for today’s NFL. He is often compared to JuJu Smith-Schuster and while that may be setting the bar high, the comparison is not a bad one. Brown is a big-bodied receiver at 6’0″ and 226 pounds, yet he was running out of the slot at Ole Miss. He has the ability to run outside, although the slot is where he is best utilized. He is a great route runner and has great hands. Once he gets the ball in his hands he can do a lot of damage after the catch. The one weakness with Brown is he can struggle to create space downfield and is best utilized in short or intermediate routes. 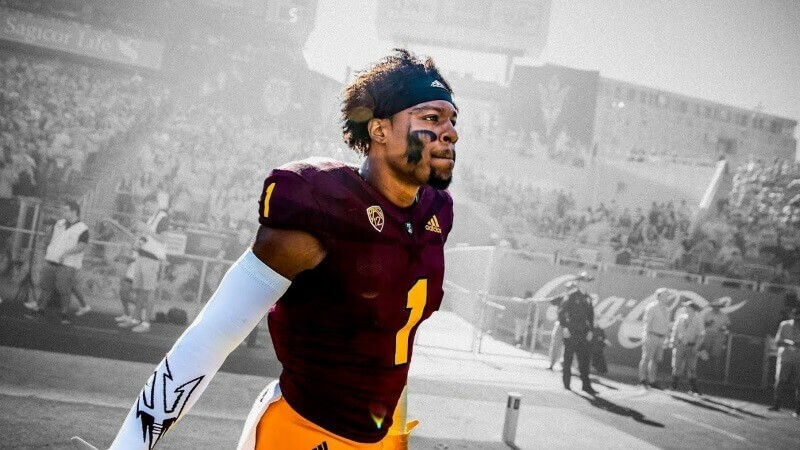 He is a lot like Harry in the sense that I think he is super safe and going to produce at the next level, but I do not think he has the highest ceiling in this NFL Draft. All the teams that would be good fits for Harry are also good fits for Brown, as they are teams that could use a big slot receiver. I think Brown and Harry will be fantasy football contributors, as long as they land in a good fit. Metcalf is the opposite of Harry and his Ole Miss teammate, Brown. We all know that he is a freak athlete. The countless pictures on Twitter back that up but if you need more, he ran a 4.33 40, tied Harry for the most bench reps among receivers at 27, and had a 40.5 vertical jump. We all know though that he struggled with the three-cone drill running it slower than Tom Brady! Some point to bad technique or the fact that he slipped. That could be the case, but his agility and his ability to change speed and direction do come into question. We know he has great straight-line speed and is a downfield threat. He has a big catch radius and at 6’3″ with hops, he should be a red-zone weapon for whichever team drafts him. Unlike Brown and Harry, he is much better outside and I would be surprised if an NFL team used him in the slot. He has the highest ceiling of receivers in this class, both in the NFL and for Fantasy Football. However, he could be the next in a long line of big athletic receivers whose game simply does not translate. There are concerns with Metcalf, but there is also sky-high upside. A good fit for Metcalf would be teams that need a big outside wideout who can be used in the red zone such as the Bills, Colts, Jaguars, Steelers, Vikings, Giants, and Redskins. He’s so known by his nickname that I had to include it! But before you think he went Hollywood like Hulk Hogan did years ago, it is actually because he is from Hollywood, Florida. So yeah… quiet the opposite. His biggest strength is obvious… it is his BLAZING SPEED! He is a big play threat that can not only create a ton of separation downfield but who is a precise route runner and can take the ball the distance at any point. I am not sure which is scarier, seeing him run a streak down the sideline or catch a bubble screen and running with the ball in his hands. He is a weapon in either scenario. I cannot help but envision a young DeSean Jackson when I watch Brown play. The concern though is obvious as well… it is his size. Brown is 5’9 and 166 pounds. That is small, even compared to other small wideouts. Jackson entered the NFL at 6’, 178 pounds. The concern with Brown’s size is twofold. The first obvious concern is whether or not he will be able to hold up to a full NFL season. The other is if cornerbacks will be able to jam him at the line of scrimmage and prevent him from using that blazing speed. The other concern is if Brown is used more to keep defenses honest, at least early on, while being thrown his way just a couple of times per game. Think like John Ross. Much like Metcalf, Brown possesses a ton of upside as he is the most dangerous weapon in this NFL Draft class. However, there are enough concerns to knock him down the board a bit. Some good fits based on needs would be the Cardinals, Panthers, Giants, Titans, and Patriots. Campbell is a lot like Brown in the sense that his best weapon is pure speed. He ran a 4.31 40, which tied with Andy Isabella (sleeper!) for the fastest 40 among receivers at the 2019 combine. Much like Brown he can take the ball the distance at any point. You can line him up out wide and have him streak down the sides or you can put him in the slot. However, this is where he begins to differ from Brown. While he is also a YAC machine and can play in the slot, he is not nearly as precise of a route runner as Brown. Because of that, he does not have the same upside, at least early on, as Brown does. However, at 6’0 and 205 pounds, size is not a concern. Campbell has helped his stock and you should not be shocked if you hear his name called on Day 1. He is a good fit with the same teams as Brown, as those are teams that can use a speedster. I expect whoever drafts him will use him outside, while mixing him into the slot at times. I expect him to be in motion often, to help keep defenses honest. The hope is that any team that drafts him looks to utilize his speed, without asking him to dive deep into the route tree. I am a big fan of Arcega-Whiteside as he reminds me of Harry. Arcega-Whiteside is great at the point of the catch. Like Harry, he is excellent at using his body to box out almost like a basketball player and create separation between the defender and the ball. He is one of the most physical wideouts in this draft and is excellent at using his hands, both to create space and at the point of the catch. He is perhaps the best-contested ball catcher in this draft. He excels at positioning his body on jump balls and seems to be at his best in small spaces. Which is great, because his weakness is that he lacks elite speed to create separation down the field. Arcega-Whiteside does not have the highest ceiling of receivers in this class, but he is a safe pick who can make an immediate impact in year one. He would be a good fit for the Packers, 49ers, Titans, Giants and Panthers. These are my top six wide outs heading into the 2019 draft. These are the names I expect to hear go off the board in the first two rounds and have the shot to be a fantasy contributor in year one.